Just two weeks after Jeff and I started dating, he gave me a book with a note written on the inside cover. 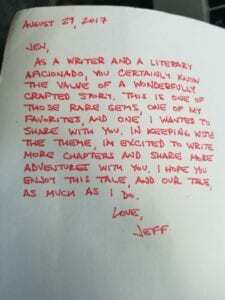 It was the first time that I would see Jeff’s beautiful handwriting, meticulous grammar, and the use of his famous red pen. It was also the first time that I realized just how easy it was going to be to fall in love with him.